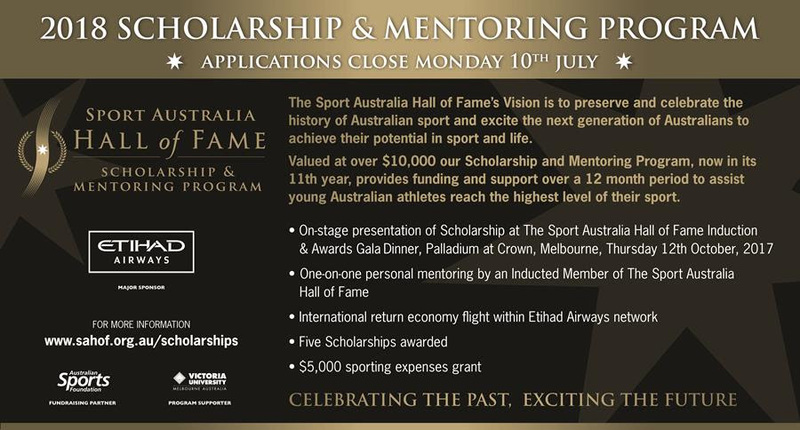 Australian junior athletes (U/21) are invited to apply for The Sport Australia Hall of Fame (SAHOF) Scholarship & Mentoring Program annually. The Sport Australia Hall of Fame’s Vision is to preserve and celebrate the history of Australian Sport and to excite the next generation of Australians to achieve their potential both in sport and life. The Scholarship & Mentoring Program is one opportunity to continue achieving our Vision by helping young Australians achieve at the highest level of their sport. The Scholarship Program, proudly supported by Etihad Airways, Victoria University and the Australian Sports Foundation will provide encouragement, support and funding for 12 months. Most importantly, Scholarship Holders will enjoy unrivalled access to, and personal one-on-one mentoring from an Inducted SAHOF Member, surely no greater way to inspire young sportspeople to fulfil their potential. One of Australia’s most prestigious organisations, The Sport Australia Hall of Fame, represents the pinnacle of sporting achievement in Australia by acknowledging sporting greats who have gone beyond their sport to achieve cultural significance. Inductees include Sir Don Bradman AC, Dawn Fraser AO MBE, John Eales AM, Catherine Freeman OAM, Ian Thorpe OAM, Liz Ellis AM, Glenn McGrath AM, Shane Warne, Layne Beachley AO, Kostya Tszyu, Louise Sauvage OAM and many more. Each Scholarship is applicable for 12 months, January 1 to December 31. One-on-one personal mentoring by an Inducted SAHOF Member. A $5,000 sporting expenses grant. On stage presentation of the Scholarship at the SAHOF Induction & Awards Gala Dinner at the Palladium at Crown Melbourne. One international return economy flight within the Etihad Airways network, (for sporting use only). ‘The Sport Australia Hall of Fame Scholarship Holder’ logo for agreed use. Since the introduction of the Program in 2006, over 60 young Australian athletes (Scholarship List) have benefited from the opportunity of a lifetime to draw on the experience and wisdom of The Sport Australia Hall of Fame Members in addition to the valuable cash grant and international airfare. Scholarship holders have been privileged to be mentored by such Australian sporting greats as; Catherine Freeman OAM, Susie O’Neill OAM, Rechelle Hawkes OAM, Adam Gilchrist AM, Robert de Castella AO MBE, Bruce McAvaney OAM, Nick Farr-Jones AM, Andrew Gaze AM, Liz Ellis AM, Mick Doohan AM and SAHOF Chairman, John Bertrand AO. The success of this Program is outstanding, with 20 past Scholarship recipients representing Australia at the 2016 Rio Olympic and Paralympic Games and 17 at the London 2012 Olympic and Paralympic Games. Chairman John Bertrand AO who was Mentor to 2013 Scholarship Holder and 2012 Olympic Silver Medallist, Olivia Price, said; “the Mentoring is a money can’t buy opportunity. The impact of the Mentoring on our Scholarship Holders has been profound”. Brad Woodward, 2017 Scholarship and Mentoring Program recipient, who is currently being Mentored by Clint Robinson OAM, cannot believe how incredible this opportunity has been. Brad; “I am so honoured to be a Sport Australia Hall of Fame Scholarship Holder. The opportunity to be mentored by the one of the most successful kayakers and lifesavers in Australian history, Clint Robinson has been incredible and I can’t be more thankful for the opportunities this Program has and continues to provide me”. 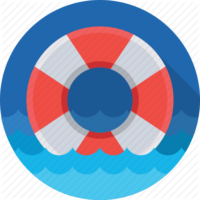 The eligibility criteria and nomination forms are available here: Nomination Information. 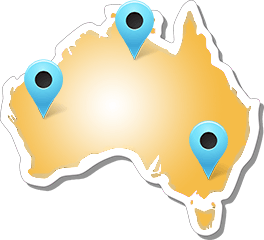 If you would like to support our young Australians achieve their goals and support the Scholarship & Mentoring program, please complete the below Donation Form.